Harrington targeting more majors: "I might be the first guy to do it, but I believe it can happen"
Pádraig Harrington is the kind of guy you write off at your peril and as he embarks on another PGA Tour season in Las Vegas this week, it's clear he's not giving up hope of getting back to his major winning ways. Speaking to Ed Graney, a columnist with the Las Vegas Review-Journal after an opening 71 in the Shriners Hospitals for Children Open, the 43-year old Dubliner insisted he wanted to win another major or two. Being less intense and fearful on the golf course is a big goal. Pádraig Harrington endured a mixed day on the greens as he opened with a one under 70 to trail Stewart Cink and Martin Laird by six shots after the opening round of the Shriners Hospitals for Children Open in Las Vegas. Pádraig Harrington might be having trouble getting his career to take off again but not even a piece falling off his private plane could ground him in Las Vegas this week. Winning the Honda Classic has offered Pádraig Harrington a new lease of life on the PGA Tour at the age 43. 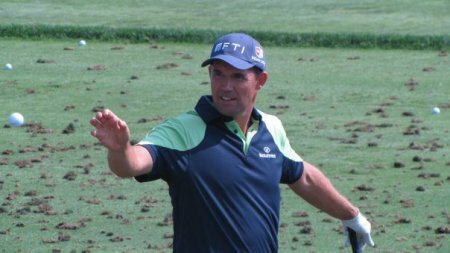 Padraig Harrington was in great form ahead of a tournament that could turn a mediocre season into one of his best ever. With permission from Tiger Woods, a win in the Tour Championship would be worth $11.35m to the Dubliner - $1.35 for the title and another $10m for winning the FedExCup (tee times - points standings). Reflecting on his black and white season, he said: "It was possible it was going to be one of those years you just have to write off. But the FedExCup has given me the opportunity to change that around. We're still going; it's still in the balance. As I said, if I can get that win, it would turn the year into a very successful one." Harrington is bursting to win again but he's also sounding very relaxed.